Create elegant Simple Pumpkin Napoleons for your guests. Layer packaged won ton wrappers, a pumpkin-COOL WHIP mixture and more for the ultimate show stopping autumn dessert! 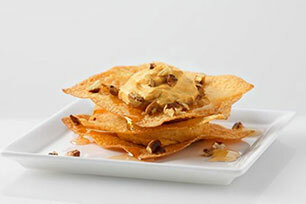 Top these Simple Pumpkin Napoleons with toasted pecans for a pretty finish. Beat first 4 ingredients in large bowl with whisk 2 min. (Mixture will be thick.) Stir in COOL WHIP. Refrigerate until ready to use. Place won ton wrappers in single layer on parchment-covered baking sheets. Brush with butter; sprinkle with cinnamon sugar. Bake 6 to 8 min. or until golden brown. Remove to wire racks; cool completely. Top each of 12 won tons with about 2 Tbsp. pumpkin mixture. Repeat layers twice. Drizzle with syrup just before serving; sprinkle with nuts. Prepare using 2 pkg. (1 oz. each) JELL-O Vanilla Flavor Sugar Free Fat Free Instant Pudding, fat-free milk, COOL WHIP LITE Whipped Topping and margarine.